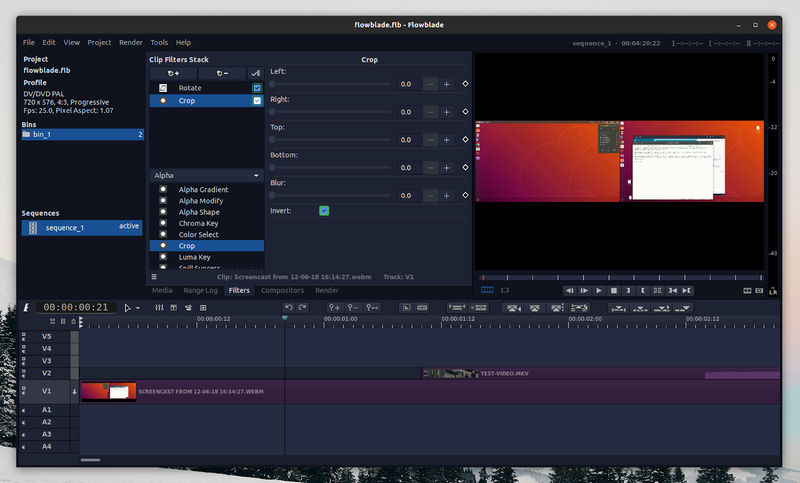 Flowblade features editing tools like move or trim, image compositing with 10 compositors and mix, zoom, move and rotate animations capabilities, image and audio filtering (with 50+ image filters and 30+ audio filters), built-in title tool, G'MIC effects tool, to name just a few of the things this tool can do. The video editing software supports most video and audio formats, depending on installed MLT / FFmpeg codecs. Flowblade 2.0 also includes some user interface updates aimed to clean up and modernize its design. For this, a new custom dark theme was created and made default, while some UI elements, like the panel, have been updated. Users can change to a regular dark or light theme, from the Flowblade preferences. Also, the Overwrite tool name has been changed to Move. Besides the new Keyframe tool, keyframe editing has received some other updates as well, including slider to keyframe editor functionality, or buttons to move keyframes 1 frame forward or backwards. With the 2.0 series, Flowblade will continue to use Python 2, with the plan being to switch to Python 3 with the Flowblade 3.0 release. The complete Flowblade 2.0 release announcement can be found here. The Flowblade installation page mentions installing the application on Debian, Ubuntu and Linux Mint by using the DEB binary from the project releases page, from Flathub, from the repositories (but this might be an old version on some Linux distributions), or using the source code archive.